See the best of the Balkans, Hungary, Austria and Germany. 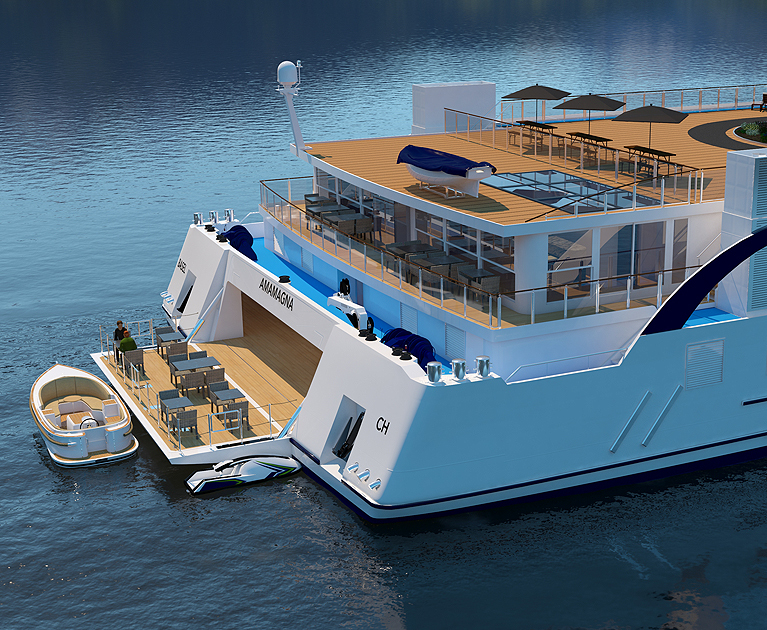 Raising the luxury stakes on Europe’s waterways, the brand new MS AmaMagna features some of the largest suites in river cruising with full outside balconies, multiple dining venues heated pool, Zen Wellness Studio, intimate Sundowner vessel and leisure platform. 14 Jun 2020 departure, subject to availability. On arrival into Bucharest, you’ll be taken straight to your ship docked in Giurgiu. You’ll have time to unpack, relax and get acquainted with your ship. In Veliko Târnovo, a local expert will guide you through the city’s rich history. Alternatively, should you want to get more physical, explore the Rock-Hewn Churches of Ivanovo. Explore Baba Vida Fortress in Vidin, raised upon the remains of the ancient town of Bononia. Afterwards, venture to Belogradchik to uncover its ancient fortress on the northern slope of the Balkan mountains. You’ll also see the town’s unique rock formations. Cruise through the Iron Gates and experience one of the most awe-inspiring natural wonders you will encounter on this cruise. Your ship will ribbon its way through the series of gorges between Serbia and Romania. In Serbia’s capital, perhaps see the Belgrade Fortress and the Serbian Orthodox Temple of St Sava. If you’re feeling more active, explore the city by bike, or if you fancy a tipple, visit a brandy distillery. Wine lovers can head to a vineyard in Ilok, where a tasting allows you to appreciate the fertile soils that have been making wine since the 16th century. Otherwise in Vukovar, perhaps familiarise yourself with the poignant sites of the Yugoslavian Civil War. From Mohács, perhaps visit the Buso Courtyard to gain an insight into the Busojaras of Mohács, along with this event’s quirky craftworks. Or venture to the ancient city of Pecs and wander the Gyugyi Museum. A new day presents new choices in sightseeing. Head to Budapest Station’s Royal Waiting Room, where you’ll enjoy a welcome reception before boarding the Grand Empress steam train, where a game lunch is served. You will also see inside historic carriages from the early 1900s. At your destination, Gödöllő Palace, take a private tour. Start the day with a guided tour of Budapest. Afterwards, enjoy your Signature Experience. Later, experience an incredible illuminations cruise. See the Fisherman’s Bastion and Heroes’ Square. Alternatively, the active may like to hike to Gellert Hill. Or perhaps enjoy a more relaxed pace with a culinary walk through Budapest’s Great Market Hall. Enjoy a peaceful morning cruising towards Vienna. On arrival, take in Vienna’s Ringstrasse, plus visit St Stephen’s Cathedral. Tonight, at the regal City Palace in the heart of Vienna, we are putting on an exclusive cocktail party and private recital, just for you. The 1,441-room Schönbrunn Palace and its gardens are a favourite. Or tick another country off your list and journey to Slovakia’s Bratislava. Otherwise, get active with a bike ride to Klosterneuburg Monastery. Another day in Vienna presents new options to soak up this beautiful city. Enjoy your Signature Experience this evening. From Melk, visit the statuary-adorned Melk Abbey. Otherwise, a local expert is on hand to show you around town. Perhaps roam Dürnstein’s cobblestone lanes at your leisure or take a guided bike tour along the river. Whether you’re on a bike or on the ship, enjoy the spectacular scenery of the Wachau Valley on your way to Melk, where you will then choose your sightseeing. From Linz, head to Salzburg to visit some of the sights featured in Roger and Hammerstein’s classic film, The Sound of Music. Or set off into the Czech Republic, where Česky Krumlov awaits. Choose your sightseeing today. Later this evening, cruise towards the city of Passau. Having crossed into Germany, embark on a morning city discovery of Passau, where you will roam the cobblestone lanes of the Altstadt. Later, arrive in Vilshofen, where an evening of Bavarian food, music and dancing unfolds as you celebrate the days that have just passed with your new-found friends. The time has come to say goodbye to your wonderful crew and friends. Disembark your ship in Vilshofen, and then be transferred to Munich airport for your onward flight. Advertised prices are person twin share, land only, correct at time of publication and are subject to availability and change at any time without notification due to fluctuations in charges, taxes and currency. Offers valid on new bookings only. Prices based on a category D, twin window stateroom. Limited suites/cabins/staterooms on set departures are available. A first non-refundable deposit of $1,000 pp is due within seven days of booking. Final payment due 100 days prior to departure. Bonuses are included in the advertised price. ¹Fly to Europe in economy class from $495 per person is subject to availability of airline and booking class. Once class is sold out, surcharges apply. Flights must be booked by APT through your personal travel manager. Airfare offers are valid ex. Melbourne/Sydney/Brisbane/Perth/Adelaide. Flights are based on wholesale airfares in economy class (W class) with Singapore Airlines depending on routing (or another airline of APT’s choosing) with air taxes up to $250 pp. Surcharges will apply if air taxes exceed this amount.^Deposit Cancellation Cover is valued at $95 per person. Cancellation can be up to 100 days prior to the tour departure and deposit will be retained as an ATG holding credit to be used for future bookings for up to 3 years. If deposit cancellation cover is claimed, monies held must be used on a future cruise or tour and cannot be redeemed against the original cruise or tour departure date. Deposit held in credit will exclude fees imposed by third parties in relation to – air and rail travel, hotels and cabins on Voyages cruises. When booking airfares through ATG (including when taking advantage of a special offer that includes air travel), standard airline cancellation fees will apply. In some cases, airfares will be non-refundable. In the event of cancellation, these fees will be deducted from the deposit paid, and therefore the credit being held. ATG Deposit Cancellation Peace of Mind applies to new bookings only and is only valid up until 100 days prior to travel. Other conditions apply. Please contact your personal travel manager for full terms and conditions.